Looking for the top hood cleaning technicians in Tampa? Well, Tampa Hood Cleaning Pros is the professional hood cleaning company that goes the extra mile to provide you incredible cleaning and top of the line service. 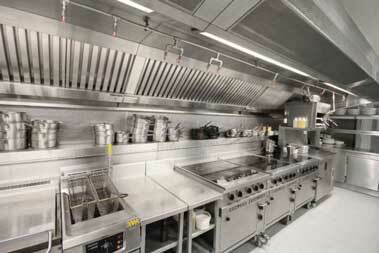 Our professionals provide detailed inspections of your commercial kitchen and give it the deep cleaning that it needs. It is our hope to help you keep a clean, and as a result safe, kitchen. You can run your kitchen with confidence when you start with a kitchen free of unnecessary fire hazards like excessive grease. The way that Tampa Hood Cleaning Pros takes a step beyond the competitors is through detailed inspections and complete kitchen exhaust system cleaning from licensed technicians. Taking care of your entire kitchen by cleaning the fans, checking the roof for grease build up, cleaning the ducts, and even helping with grease baffle filters, that is the complete care we provide. Leaving no stone unturned and ensuring maximum cleanliness is a guarantee with us. It can never be understated how important keeping a clean kitchen is when you are in the food prep business. A dirty hood system could be the cause of any number of serious problems from fires to pests. No one takes the cleanliness of your system more seriously than the professionals at Tampa Hood Cleaning Pros. With our detailed inspection, deep cleaning, and friendly advice for future maintenance cleaning, you will get the well-rounded attention that your kitchen deserves. We all know the risks involved with commercial and restaurant kitchens. When you have so much to cook, and expensive equipment, and a kitchen staff that needs to be safe, it can be hard not to worry. A grease fire would be devastating on so many levels, but with Tampa Hood Cleaning Pros you can sleep easier, because our team removes grease from your system to keep it safe. Be sure to give us a call or contact us today to find out when you can set up an inspection and cleaning for your kitchen exhaust system. 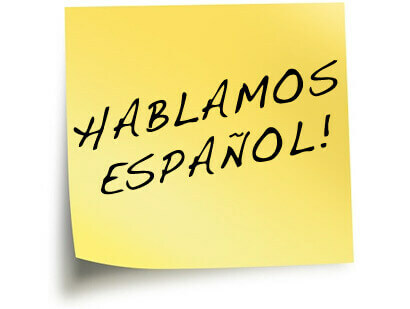 One thing you are sure to experience with our technicians and staff is a relaxed and fun loving group. Don’t let that fool you though, this team is incredibly dedicated and takes the work of hood cleaning seriously. With incredible respect and understanding for your staff, our trained hood cleaning technicians will work to get your kitchen cleaner than ever before. It is also our goal to make sure that your staff understand all the ways in which they can safely maintain and clean your equipment in between appointments. 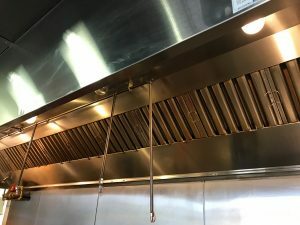 Not every hood system is the same, which is why we only bring you experienced cleaning professionals for kitchen exhaust systems in Tampa Bay, Clearwater, Port Richey, Lakeland, St. Petersburg, Sarasota, Fort Meyers, Naples, Marco Island, and all of the surrounding area. This team of pro hood cleaners are able to work with any system. Whether you are working with the shiniest new model, or you have an older set of toys, there won’t be any issues for us to clean it. There is nothing more important than knowing that you can trust the exhaust hood cleaners you hire to keep your equipment and staff safe, and our level of experience brings that to you. If you are in need of professional hood cleaning to make sure that your kitchen is up to code, and truly shines against the competition, then make sure to give us a call. We will be so happy to provide you with a great exhaust cleaning and tips on how to keep your kitchen looking great. Is it Time for You to Call Tampa Hood Cleaning Pros? Do you have a system for knowing when it is time for a hood cleaning service or exhaust system check-up? If you do, that is awesome, but some people have questions, so here is the long and the short of it. Usually, insurance companies, the department of health, and the fire department all have standards for how often your kitchen needs to be cleaned. The best place to start when trying to decide if it is time to get a professional hood cleaning for your kitchen is by checking with your insurance company and the department of health. Once you know what the minimum requirements are for your insurance policy and local fire codes, then you can begin to think about what will really keep your kitchen exhaust system as clean as it needs to be. Do you notice visible residue from grease that you cannot scrub off when cleaning regularly? 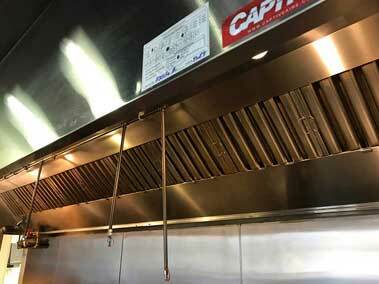 Do you notice a foul grease odour coming from the ductwork or exhaust hood? Is the exhaust fan rattling? Can you see grease stains on your roof? Are you unable to remember the last time your hood exhaust system was cleaned? Are there any dents on your hood system? Anyone that works with kitchens knows that the smallest sign of trouble could lead to big trouble if it gets ignored. Grease fires can be started far too easily and there are plenty of other health hazards involved with grease build up. Grease on the rooftop will quickly destroy the roof materials and it can cause a leak or a caved-in roof faster than you realize. Grease buildup increases your risk of fires, corrosion, pests and foul odours. From the least worrisome issues to the really scary stuff, it is all things your kitchen wants to avoid. Check with the fire marshal, your insurance company, and the health inspector to find out what the cleaning service requirements are for your restaurant. Beyond the requirements, Tampa Hood Cleaning Pros recommends a professional kitchen cleaning service every 90 days to maintain a true clean.